“Somebody once asked me why I became a chemist. 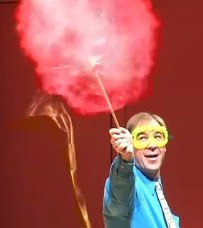 It’s because I get paid to blow things up,” said Doug Mulford, an Emory chemistry lecturer, as he set a flame to a hydrogen balloon. The explosion greeted more than 200 DeKalb County high school students who visited Emory recently to celebrate the International Year of Chemistry. The teens were split into groups labeled “hydrogen,” “bromine” and “cobalt,” and treated to demonstrations by Emory chemistry students of how to make fake snow, turn a bouncy ball into glass and use a banana as a hammer. “A lot of people tend to think that chemistry has nothing to do with their everyday lives, which is really interesting, because essentially you are a really big beaker of chemicals,” Mulford said. The event was hosted by the Center for Chemical Evolution, a research and educational outreach program based at Emory and Georgia Tech, funded by the NSF and NASA.